This is the page where really really important stuff about this site and me will appear. This may be where my blog will appear. 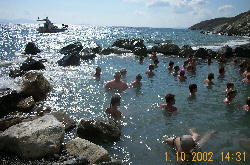 The picture above was taken on the island of Kos in October 2002, it is at a point on the coast where a volcanic spring enters the sea. It smells but it is lovely and warm.